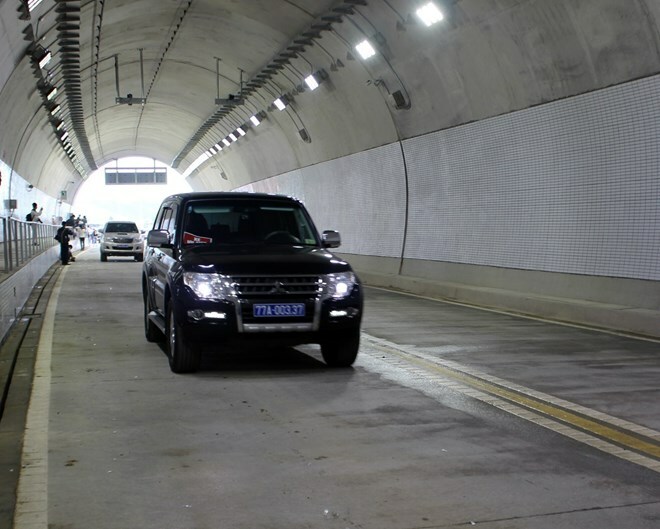 Cu Mong tunnel, which connects the central provinces of Binh Dinh and Phu Yen, opened to traffic on January 21. Built under the build-operate-transfer form by Deo Ca JSC from September, 2015, it was completed 2.5 months before scheduled time (March 31). This is one of four key national projects this year besides Cat Linh-Ha Dong railway, Bac Giang-Lang Son highway. The 6.62km tunnel allows a speed limit of 80km/h. It will take only six minutes to travel through the tunnel. Deputy Minister of Transport Le Dinh Tho said that the tunnel would help shorten the travel time between Binh Dinh and Phu Yen, improve the traffic network, ease congestion and traffic accidents. The tunnel will help with socio-economic development in the central region, he said. Huynh Tan Vien, Secretary of the Phu Yen Party Committee said, the project will provide favourable conditions for trade exchange and the exploitation of local potentials. Meanwhile, Nguyen Thanh Tung, Secretary of the Binh Dinh Party Committee, Cu Mong tunnel is important to regional connectivity for economic development.